Urethane millwork is a great alt ernative to traditional wood millwork and a popular choice when restoring, remodeling or for new construction. Urethane millwork has the look of plaster or wood without the cost and offers a number of advantages. 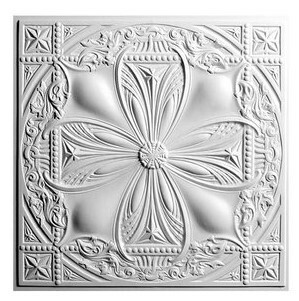 Made of a polyurethane foam, this durable and lightweight product has the same beautiful detail of plaster or wood, but urethane will not split, crack or rot like wood. It is also weather and insect resistant making them it ideal for outdoor use. It is also impervious to insect infestations. 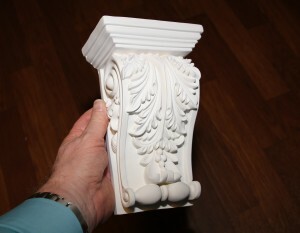 appliques and onlays, baseboard, corbels and brackets, capitals, ceiling medallions and rings, ceiling tiles, chair rails, coffered ceili ngs, crossheads, crown molding, facia molding, finials, frame molding, molding corners, panel systems, rosettes, sconces, stair brackets, fireplace surrounds, and gable vents. 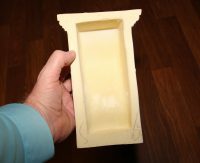 Urethane is used primarily in decorative applications and is not designed for supporting weight. Restores urethane products come factory primed white during the mold process and are shipped ready to paint, faux finish, or gel stain. Install using construction adhesive and/or screws. 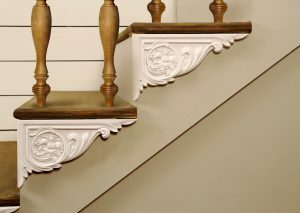 Here are the steps for installing a urethane corbel. 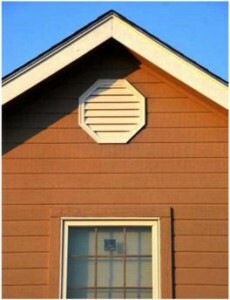 1 – Lay the corbel face down on a soft surface like a towel that will not mar the product face. 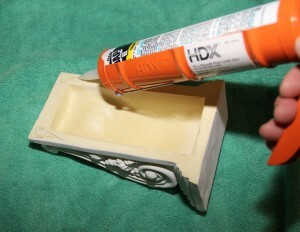 2 – Apply a continuous bead of adhesive along the back edges of the corbel. 3 – Gently and carefully press the corbel in place where you want it. 4 – Apply caulk to edges of the corbel and smooth any excess caulk with you finger. Wipe any excess caulk with a damp rag. ail holes with caulk. When the caulk dries, lightly sand with extra-fine sandpaper and touch up with paint.